This year I’m making up ‘wartime hampers’ for Christmas pressies. The food component is going to be ration book themed but also the hampers will contain a variety of homemade household goodies as gifts so today I experimented to see if I could actually make some of the things I wanted to include. Homemade goodies now decorated with off cut material Sarah sent me~! 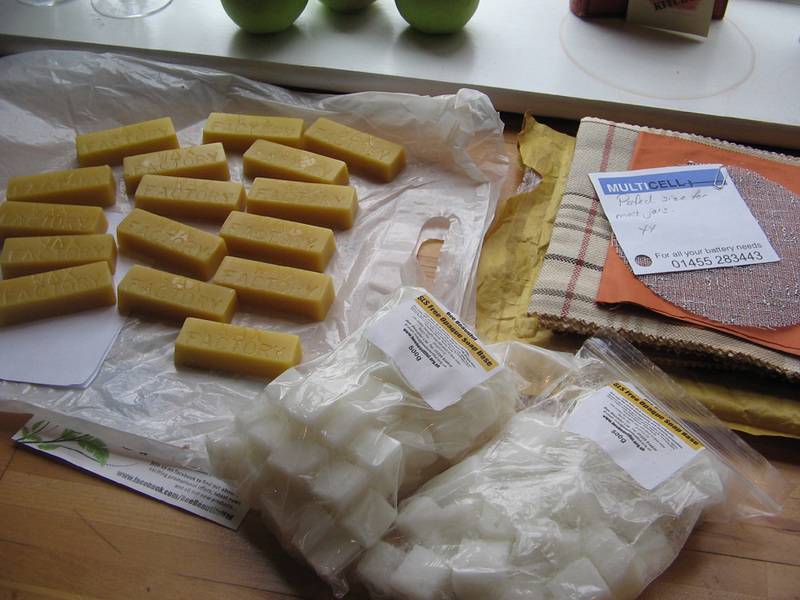 First of all I melted small cubes of opaque glycerin soap (10 cubes for each bar) to which I added some colour and essential oils once the cubes had melted (about 4 drops of essential oil per 10 cubes and a drop or two of pigment). 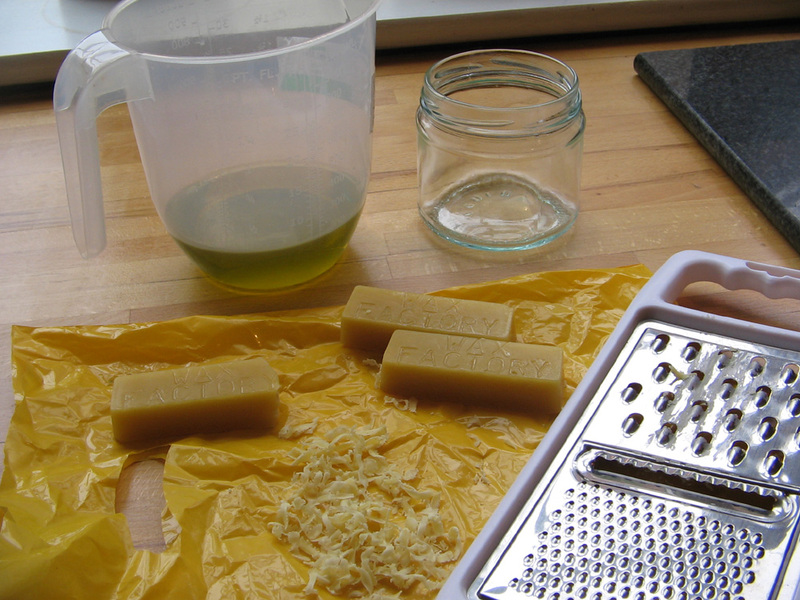 I made two lavender soaps and two lemongrass and bergamot soaps. Once it was mixed together (I just used an old non-stick saucepan and wooden spoon) I poured the mixture into a latex mould and one hour later the bars were hard enough to remove! 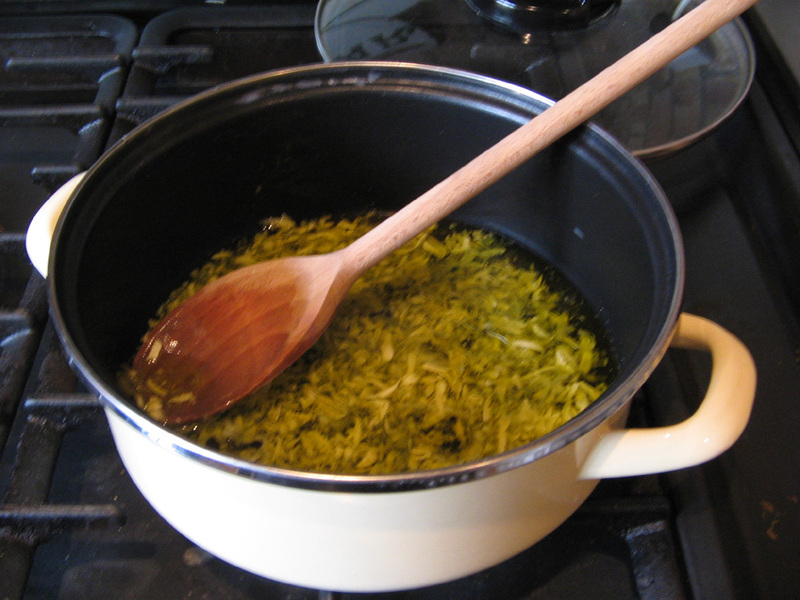 Place the mixture into an old saucepan and melt very slowly… it really is quick to do. Add your essential oils. I added about 12 drops of lavender. 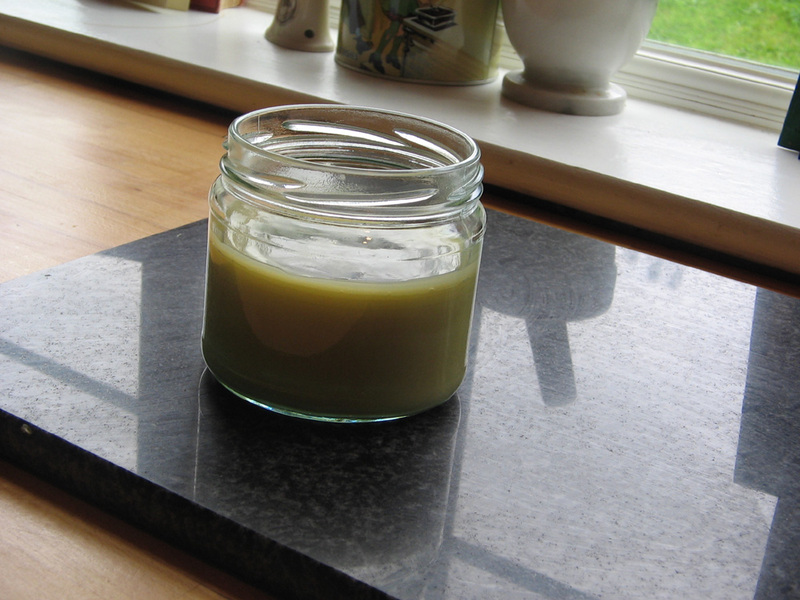 You can try to add pigment if you like but olive oil and beeswax naturally solidifies to a pale green/buff colour so you’d have to add a lot of pigment and that could then stain your wood so personally I wouldn’t add colour. Next I took it off the heat and stirred gently and left it to cool for a few minutes, stirred again then poured it straight into a shallow wide mouthed jar (I used a salsa jar my eldest daughter had finished using). And that’s it! It smells great and makes a wonderful nourishing polish free from nasty chemicals and the whole jar probably cost me less than £1 to make! This will definitely be going in my Christmas hampers!!! This entry was posted in Uncategorized and tagged homemade lavender furniture polish. Bookmark the permalink. just a thought but how about making up wartime Christmas hampers to sell? Would be a very unusual gift and I would not mind betting you get more orders than you can cope with. Could be the start of a business venture. That is a fantastic idea. 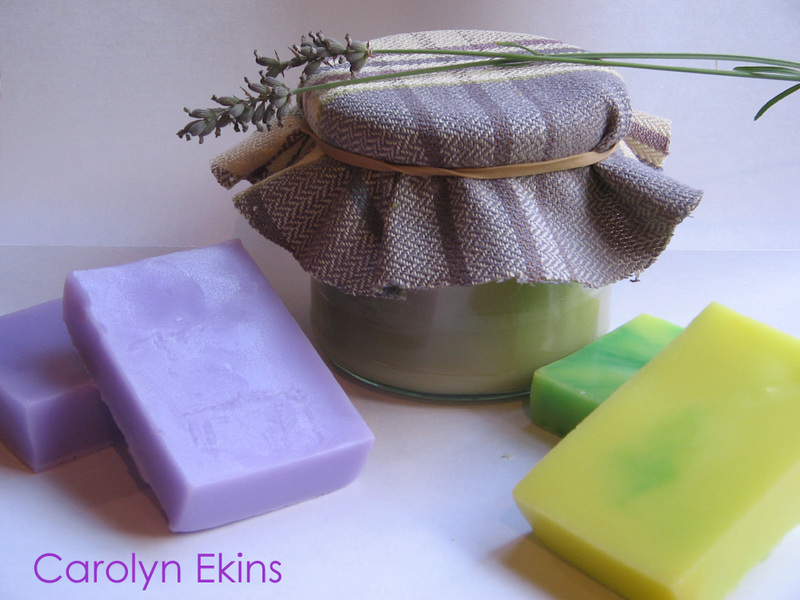 I love the lavender soaps. – Small packets of flower, vegetable or herb seeds to plant on the spring. – nice stationery. You could single-handedly restart letter writing and then I would love you even more! 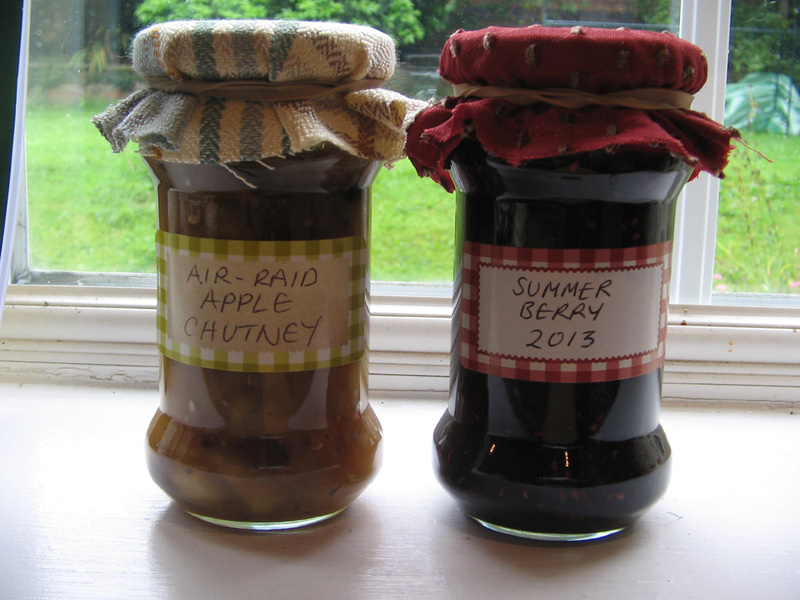 Oh, and of course you could bottle up home made mincemeat. I loath modern mincemeat but the wartime one padded out with apples (and carrots?) is lovely. Clearly I was joking about the torch batteries! Hi C, just had another idea … Rosehip syrup – very big in the 1940s. In “World War II clinical scientists discovered the healing potential for rose hips. Several medical studies were performed in the 1940s which showed the high levels of vitamin C contained in the tiny fruit. When Britain experienced difficulties in getting citrus fruit into the country during WWII, the British government began collecting rose hips to make rose hip syrup as a source of vitamin C”. Just found this blog and am very interested in the war time Christmas hamper idea. As a tribute to an uncle who lost his life in the war I was doing the wartime diet thing myself – lost 3 and 1/2 lbs in 2 weeks but never went hungry. Looking forward to finding my way round the site.